Before proceeding, a brief disclaimer: I received a copy of the book as a gift (i.e. free) from the publisher, TCK Publishing, and was asked if I’d write a review when I finished it. The thoughts and opinions expressed in this review are my own and were not influenced by the publisher or editor in any manner. The book is broken down into three parts. The first part is the most theoretical, but it is also foundational and necessary before diving into the practical application of Mackintosh’s system. In it, he takes the concepts from some of my favorite books such as 7 Habits of Highly Effective People, The Slight Edge, Deep Work, and others, stitches them together, and presents them as a method of analysis and self-reflection. It forces you to examine yourself and your habits, critically,so you are prepared to take the steps for meaningful change. It will challenge you, but Mackintosh provides encouragement throughout to keep you going. The second part is the nuts and bolts. It’s where Mackintosh covers the details of his system as well as the tools to implement it. I like how he breaks the system down into manageable pieces and uses memorable acronyms to describe it. W for WHACK. This is the setup where you determine what it is you want to do. We’ll break this acronym down in a minute. A is for Act. It’s where you actually do your project. The W’s – What, Why, When and Where. In other words, What are you going to do, Why are you doing it, When are you going to do it, and Where are you going to do it. Without a plan, there can be no action. H is the How you will do it. A if setting up Accountability, which to me is one of the keys of the whole system. Accountability is what really drives home the discipline, especially for entrepreneurs or people who work on their own. Sure, you can be accountable to yourself, but having an external accountability person (or partner) can be an essential piece to keeping you focused on the end goal. C are the Conditions and Structures that enable you to get the job done. These are best thought of as rituals – the activities that get you in the right frame of mind, the mood, to get things done. K is the Kick-Start. This is where the rubber meets the road. It’s where you right down the actions you need to take to get things done. He has a great Thomas Edison quote in the book that explains why this is important, “Vision with action is hallucination.” With the actions in place, you can start doing, aka acting, which is a great segue to the second part of the system. The third part of the book is the summary. It has the implementation steps neatly summarized in one place. There are worksheets, templates, and self-accountability contracts. In a nutshell, it’s all the things you need to make your project happen. As Mackintosh says in the book, I would suggest reading it cover to cover first so you have a good understanding of the system as a whole. Then you can go back and map out your first challenge. I’ve finished the cover to cover reading, and I’m looking forward to putting the system to the test with my first 21-day challenge. I liked Getting It Done and would recommend it as a must read, especially if you’re a consultant, contractor, or entrepreneur starting your own business. 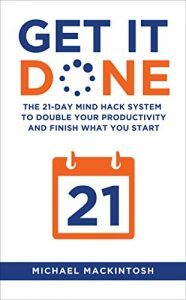 It’s a book you can use to jump start a project, to review regularly whenever you feel like you’re losing your way, or to reaffirm and strengthen habits of productivity. Because, at the end of the day, as Mackintosh puts it, what’s most important is “living a life well lived and achieving our higher purpose in life.” And that’s what he’s really hoping we (you and me) will achieve with his system.